Jibon William Gomes, a 39-year-old Catholic, told AsiaNews the incredible story of his life. "My birth took place in a bathroom." When he fell head first, he developed cerebral palsy that affected the left side of his body. But his "mother's love and God's compassion" led him to an incredible road, full of pain but also "memorable" joy. "I would like to be a living example" for those who are not handicapped. "Life is wonderful." Dhaka (AsiaNews) - "Being a person with a disability, I can understand the feeling and pain of others. Because of this, I realised that I had to do something for them," said Jibon William Gomes, a 39-year-old Catholic man, speaking to AsiaNews on the International Day of People with Disability, which is celebrated today in the South Asian nation. 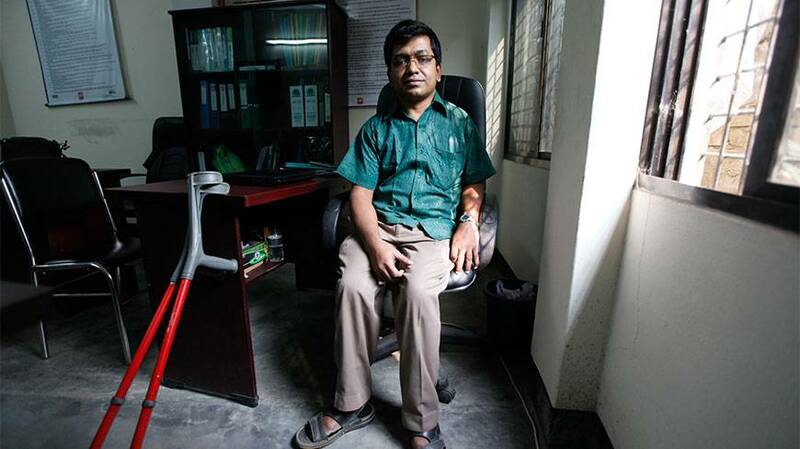 With this in mind, Jibon established an NGO called the 'Turning Point Foundation' to promote the rights of people with disabilities and include them in Bangladeshi society. Jibon's story is a great ode to life and commitment to others. According to the World Health Organisation, about 10 per cent of Bangladesh's 156 million have some form of disability. As Jibon knows all too well, the "Life of a person with disability is full of obstacles and struggles. For many, lots of barriers have to overcome to establish their rights as a human being, including in terms of their sexual and family life. I am one of them". "Every child has the right to a safe birth in the natural environment of the world. But my birth happened otherwise. My birth took place in a bathroom," he explained. "Just three days before my birth, when her labour pain began, my mother was taken to the nearest dispensary run by PIME Missionaries, located in Bonpara parish, in the remote District of Natore". The Missionaries of the Immaculate, the female congregation associated with PIME, realised immediately that something was wrong. "The sisters understood that the child my mother was carrying was not in a normal position, and decided to send the patient to a hospital in the remote District of Natore as the urgent delivery might require a caesarean operation," which could be better performed in a hospital. Before starting the long journey, "My mother went to the bathroom. She tried her best, but to her surprise she could not avoid an accident." "Falling on the brick-built ground in the bathroom, my head was cut, causing an injury to the upper right side of the brain, which mainly affected the left side and led to cerebral palsy." "However, with God's mercy I am alive. My mother gave me the name Jibon, which means life," he explained. After Jibon, his little sister Kushum was born. "But I was and I am the only son, the eldest, and disabled. My parents did their best under the circumstances, but because of financial problems what they could do had its limits." They searched for the right ways to deal with his disability, but seeing no real healing, they were deeply disappointed. "My mother adjusted herself, with deep understanding, to the fact that I was to grow up as a person with disability. My father could not. In the tensions that grew from this situation, our family suffered much," he said. Growing up in a village, without the latest treatments, "I gradually became aware of being different from the other children." "I felt pain in my heart when I saw my sister, Kushum, 3 years old then, running around and playing. Since I could not do so, I often asked my mother: "Ma, both Kushum and I are your children. Why can't I walk, while she can? Am I disabled because I did something wrong?" His mother could never answer these questions properly, and she always cried. One day, Jibon said to his mother, "Please, pray to God to take away my life and to give life to another Jibon, who can walk and play, so that you are relieved of your sadness. After hearing these words, she cried and hugged me." At the age of six years, he had his first breakthrough. "My parents began to give me books and notebooks. My mother taught me to read and write. As I showed great interest, she tried to get me into school, but because I could not move in a natural way, that proved all but impossible. So, with great efforts, she hired a private tutor." Thus, his education began. "After a few years at St Joseph's elementary school, where my mother took me in her lap by one hand and a three-wheel baby cycle in another, I was admitted to high school. My good results convinced my parents to let me continue my studies." In 1997, he earned a Bachelor Degree in Science (BSc), followed by computer training from the Social Assistance and Rehabilitation for Physically Vulnerable (SARPV). The following year he joined SARPV as a computer instructor and operator. In 2002, he received a Master Degree in Psychology from the National University. In 2003, SARPV promoted him to the position of Programme Officer and gave him the opportunity to work more widely with people with disabilities. In 2005, he joined Caritas, which offered him a contract to develop initiatives with the disabled. "The mission and vision of this organisation gave me new impetus," he said. However, "Working to boost people's potential and break down barriers holding them back was challenging beyond belief." Jibon will never forget 29 December 2010. "On that memorable day, I married Rani Olivia Rodrigues, who joined the cause wholeheartedly. Now I have two more hands to work, another head to think and another heart to love the needy," and the couple's young son, Newton Irenaeus Francis Gomes. In April 2012, he decided to change further his life. "I decided to set up the 'Turning Point Foundation,' an organisation that helps various groups working with the disabled to network, develop joint programmes and ensure access to international cooperation." "I would like to be a living example for those who struggle for a better future. The darkness and frustrations that separate us from hope can be torn away." Sindh approves law against forced conversions, "positive and encouraging"